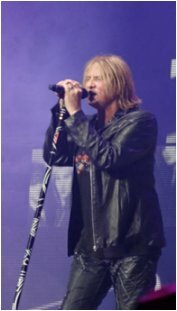 Def Leppard played the 6th show of the 2013 VIVA Hysteria! residency last night at The Joint in Las Vegas, NV with 22 songs played. Night six saw the band play an 8 song opening set as the newly reformed "Ded Flatbird". The setlist included old favourites/rarities such as 'Wasted' and 'Rock Brigade' and no songs repeated from show #5. The first four songs were taken from the 'Pyromania' album. The show started with two songs used to begin the original 1987/1988 concerts in 'Rock! Rock!' and 'Stagefright' but in reverse order. Amusingly after their April Fools Day news a 'No Ded Flatbird' sign was hung on a barrier placed in front of the thrust with the band not allowed to go on it. A rule which was broken by the end of the set.